I'm not at the Mobile World Congress event in Barcelona. I'd like to be, but I'm just a programmer. I'm not a member of the press. One could argue I don't really qualify as a blogger. With that said, I saw a headline on BBC.com today that I couldn't pass up. Ikea is releasing a line of furniture and (it appears) other items with built-in wireless charging. They'll use the Qi standard, and they'll also sell covers for a couple of devices that don't support that standard. While on the surface this may not seem as groundbreaking as some of the announcements like Android Wallet (I believe a better take on mobile payment systems), Android Auto (this better be in the next car I buy), but I think Ikea may be on to something. Sure, wireless charging gets rid of your cables, but you still have a device plugged in to your wall...and there's a cord attached for you to snag on things, trip over, whatever. This, on the other hand, is a piece of furniture. You've probably already figured out how to hide a cord to a lamp, and every day you come home and set your phone down on it. 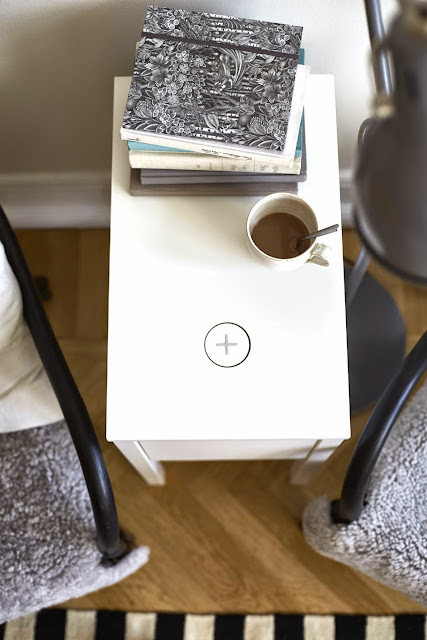 Now, when you put your phone down on the night stand or coffee table it's also charging. No plugs, no exposed wires to trip over (I'm making an assumption based on the fact that I'm much better at hiding cords to permanent things like lamps than I am with phone charges and small appliances). On top of that, they say the line will go on sale April of 2015. We're not talking prototypes, vaporware, or hype building. We're talking next month you can get these things. Awesome, or am I just easy to please?